The aim of TMC Transformers is total customer satisfaction together with the promotion of an efficient Quality policy. This aim can be reached through the continuous improvement of the processes, products and safe working conditions, by adopting a management system conformed to UNI EN ISO 9001 rules. Understanding the needs and expectations of all parties involved in order to optimize the ability to provide a product that conforms to the exact requirements through a thorough analysis of the risks and opportunities involved. Conforming to the legal requirements and other associated rules relating to the processes, the products, and to consider the risks to achieve a safe working environment in order to prevent accidents and injuries. To guarantee the safety of the workers in the work place. 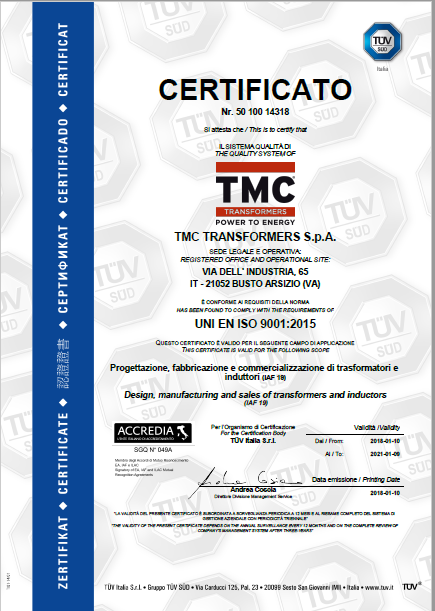 To pursue a process of continuous improvement in the technical characteristics of the design and manufactured products (transformers and inductors) in order to qualify and consolidate the position of the company and to ensure compliance with all international standards. To achieve the optimization of working processes in order to maximize the level of efficiency and effectiveness and improve the economic development of the company together with social equality and progress. To develop and spread the quality culture, to respect the environment and the safety of the work place relating to employees of the company and the supply chain in the respect of all aspects of our company requirements.